The ozone layer is a deep layer in earth’s atmosphere that contains ozone which is a naturally occurring molecule containing three oxygen atoms. Not only does the ozone layer protect our planet from the Sun’s harmful ultraviolet (UV) radiation that bombards the Earth on a daily basis, but through the absorption of this radiation it helps to warm our stratosphere – ultimately supporting and sustaining life on our planet. Recognising the importance of this, Friday 16 September marks International Day of the Preservation of the Ozone Layer. According to Paschal Phelan, Chairman of Solar Capital, this year gives the world a chance to celebrate the fact that the ozone layer is currently on track for recovery by the middle of this century. Paschal Phelan explains that scientists at MIT and elsewhere published an article in the journal Science in June this year announcing the emergence of the healing of the Antarctic ozone layer. However, he warns that there were a number of unintended side effects resulting from the Montreal Protocol, which included an increase in other toxic gases used to replace chlorofluorocarbons (CFCs) that have ultimately contributed to global warming through increasing concentrations of greenhouse gases such as Carbon Dioxide (CO₂), Methane (CH₄) and Nitrous Oxide (N₂O). “Unfortunately, this is compounded by the fact that these gasses are also by-products of our dependence on fossil fuels,” adds Paschal Phelan. Fortunately the world is starting to realise that its dependence on fossil fuels is unsustainable. Paschal Phelan says that in recent years there has been a dramatic shift towards renewable energy sources to help counter these negative side effects of the ozone layer reforms emanating from the Montreal Protocol. Paschal Phelan says that, as an example, the production of solar energy diminishes our dependency on fossil fuels and mitigates global warning through lowering the emission of greenhouse gases. Paschal Phelan explains that the production of solar energy has minimal CO2 emissions, little water usage, is inexhaustible, and it is safe. “Global electricity produced by solar power has doubled seven times over since 2000. Part of the reason for this is that solar is not a fuel, but a technology. Owing to economies of scale and increasing efficiency, prices of solar technology and supply continue to fall. As a result, the need for fossil fuels is falling internationally”. In South Africa, the move towards the provision of renewable energy through the Renewable Energy Independent Power Producer Procurement (REIPPP) Programme has been lauded for assisting in the reversion of the impact of climate change. “Let’s support the fight against climate change and the depletion of the life-sustaining ozone layer. By supporting the use of renewable energy, solar power being one of these sources, we are supporting the preservation of our earth,” says Paschal Phelan. 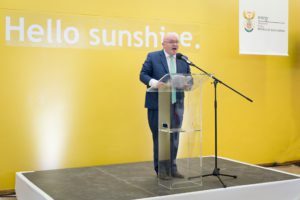 Paschal Phelan’s company Solar Capital is a shareholder, developer, project manager and joint O&M contractor of the largest solar farm in the Southern Hemisphere (175MW) based in De Aar, Northern Cape. Previous Post Previous post: What Is Solar Irradiation And How Does It Make South Africa An Excellent Location For Solar Facilities?